Pakistan Telecommunication Company Limited (PTCL) organized an exhilarating fun gala entitled “PTCL’s Got Talent” a Talent Show for Employees & their Families. The theme of “PTCL Got Talent” resonated with the aim of building a culture focusing on employee engagement and participation. It brought out the talents of thousands of employees from all the Regions of the company. Top five finalists were selected from each category by eminent judging panels through competitive series of auditions backed by online voting carried out by PTCL employees. The Final Competition of Recitation, Naat/Hamd held at the PTCL Headquarters was graced by Mr. Junaid Jamshed as the guest of honor and judge. 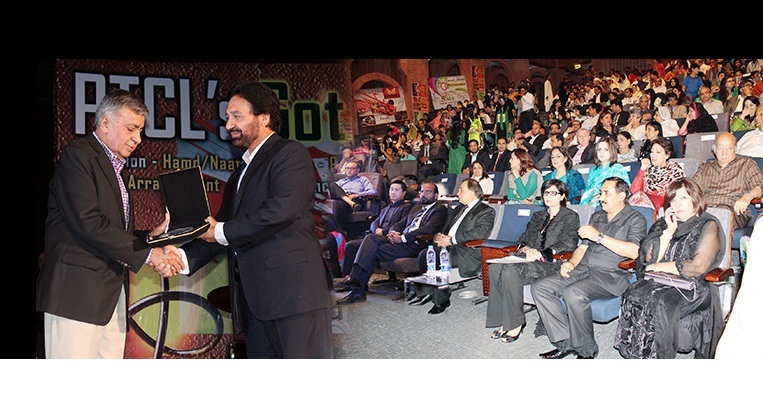 The Grand Finale of PTCL’s Got Talent held at the Pakistan National Council of Arts was attended by Farah Hussain, Agha Nasir, Kanwal Naseer, Abbas Ali Khan, Naheeda Raza, Leyla Zuberi as judges of the categories of acting, singing, dancing, painting, flower arrangement and photography. All employees actively participated to win prizes like Umrah Package, Cell phones, Home appliances, Cameras, and Cash Prizes. The Grand Finale was concluded by popular musician and singer Fakhir who invigorated and energized all PTCL employees and their families present at the event.